Thank you to everyone who contributed your volunteer stories. This forum is now closed. DNR was looking for stories about the great work being done by our volunteers. We wanted to acknowledge their dedication and effort. Where they like to volunteer on DNR-managed lands. Do they volunteer with a group? What kinds of work or projects have they accomplished? Anything else they’d like to add about volunteering and why it’s important to you. We collected stories Monday, January 31 through Monday, February 14. Rules for the conversation: The Washington State Department of Natural Resources does not allow swearing, inappropriate photos, political rants, promotional services, advertisements or the sale of products on this site. This is a place to share information about recreation volunteerism in Washington. Please limit comments to 2000 characters or 400-500 words. Thank you. If you really want to get to know a person, spend a day working side by side digging ditches, picking up garbage, scrapping muddy bridges or planting trees. I have become freinds with people that I would have never met unless I was at a work party. The one thing that I always find frustrading is the amount of damage and liter from non ORV users. With budgets cuts more and more land is being closed to reacrational use, the active and resonsable users arent around, so the rif raff moves in. Tahuya ORV park is s good examlpe, less users, more garbage and vandalizim. I’m proud to teach my children that if you want to have rights, you must be willing to volunteer your time. My family and I put in many hours ayears helping keep out ORV trails healthy and open. the time spent together is worth every hour of hard work. I am responding to your request for “volunteer stories”. The Bremerton Sportsmen’s Club has been in existence since 1919. Our membership is made up of law abiding, ordinary folks that have passion for their hunting and fishing sports. I would like to share with you our pledge that we all verbally cite at every meeting right after the pledge of allegiance to our flag! I give my pledge as an American to save and faithfully defend from waste the natural resources of my country—its air, soil and minerals; its forests, water and wildlife. In this spirit we are proud to have this opportunity to “expose” our volunteer efforts with the DNR (and other organizations and agencies). For a number of years, our members have cleaned up litter and trash during peak use periods on DNR lands and developed sites. We take it upon ourselves as individual members to educate the public one at a time if necessary, the importance of responsible stewardship of our public lands. We have the good fortune to have several retired conservation enforcement people as members and five of your members are certified hunter education instructors. The natural transfer of conservation ethics is frankly inevitable and our watchful eyes are always used to monitor and report illegal activities. By now, I believe we should be one of your most identifiable constituents in the Kitsap/Mason County areas. We hope to continue to be one of your most useful as well. We look forward to continue assisting the DNR in any way we can to insure the future of our sports. Ten years ago, Kelly Heintz , DNR Manager of Natural and Conservation Areas in the South Puget Sound Region then and now, got a bee in her bonnet to recruit and train volunteers to be Site Stewards to assist her in the care and maintenance of each of the areas under her wing of responsibility. I saw the Invitation to her Workshop in our local paper. Since my home is two miles from the Mt. Si Conservation Area trailheads, and I was already hiking up there, I said to myself, “Maybe here’s an opportunity for some “value added” fun working on projects putting my mark on those mountains.” Maybe some day I can look back and savor the satisfaction of knowing I did something beyond just using and enjoying the work of nameless others. Years ago my involvement went beyond hiking the trails to do condition reports, or participation in trail parties, to having the pleasure of being Kelly’s “go-fer” on solo projects. The sum and variety of them is too long to describe in detail and some are long forgotten. They have included: Chain saw clearance of downed timber on trails after storms; Clearing invasives like Scotch Broom; Participation in surveys for proposed trail additions; Playing dumb reconnoitering activities of boundary private parcel land owners; Directing parking at DNR events. Years ago a fellow steward and I planted seedling Grand and Noble Firs I’d picked up from a friend on the slope below a portion of the then new Mt. Little Si trailhead. Those trees are now about eight feet high! We are a membership of horsemen of all types, whether it be trail riders, gamers, pleasure or competitive in Western or English riding. All types of horsemanship is welcomed in our club. That being said we formed our club in 1962 and spent our first few years in Milton, then moved to the location we are at in Puyallup at the Meridian Riding Club, where we host Playdays from April through October and a Prize Ride every September after Labor Day. Our club members are closely associated with the National Forest rangers and the members, since their inception, volunteered thousansds of hours improving and repairing our trails. These efforts include, for at least 30 years, improvements and repairs to the Buck Creek /Ranger Creek Airfield areas, and also Deep Creek. They have repaired or replaced bridges that have been damaged throughout the winter or floods, rebuilt trails washed out, and generally helped upkeep the trails in the area. In the early years of the club the members actually made a horse camp at Buck Creek and Sun Top and worked the trails 5-6 miles a day.clearing brush and branches and whatever needed doing. A founding member, Dodie Martin said that the club cleared trails in Goat Hole and also at the White Pass horse camp, which they helped found. It was later turned into a motorized area. Several of our members are certified to instruct in chainsaw use and have certified many of our members. We do clean up every year at Buck Creek on Memorial Day Weekend and also Labor Day Weekend. Our members make a “weekend” out of the activity by camping and having a great time while cleaning up the areas of brush and garbage. Often they are involved heavily in bridge repair and other trail activities and it is not uncommon to see 30-40 people camping there having a great time and doing a work party as well. The club membership participate because we are a family of horsemen who enjoy the outdoors and want it to continue the enjoyment of it into our children’s and their children’s lives as well. It is our heritage and we need to work to keep it as it is and even make it better if we can. The memories that our children acquire are priceless in our wilderness and our wilderness is priceless too. We need to be the guardians of our precious forests for our own children and those to come and make every access available without harming the environment. We have generations of families who have enjoyed camping and riding in our forests and invite you to enjoy the experience as well. Mount Tahoma Trails a Volunteer success! I have been involved with the Mount Tahoma Trail System since its start in 1989. This trail system has approximately fifty miles of trail that link to two wood frame huts and a yurt. Since 1989 more than 25,000 people have stayed overnight at the huts and another 100,000 have come out for day use. The volunteers of the Mount Tahoma Trails Association have donated 7,000 to 9,000 man hours each year to the maintenance (installing signs, brushing trails, grooming trails in the winter, and up-keep on the huts) of this trail. They have raised funds to support the trail and been successful getting National Trails Funds to support the Trail. MTTA volunteers are proud of their excellent relationship with our landowners, the DNR, and its employees. When you ask the MTTA volunteers why they come back year after year to help maintain the trail, they point out the cost: benefit ratio. There is little to no cost to the State, and the trails provide a high-quality experience for the public. Half of the trail use is school/youth groups; everything from the Tacoma Rescue Mission Youth to scout troops to alternative schools for at-risk youth. Many college programs use the trail as well as senior groups. Families make up a large portion of our use, many with small children. It is rewarding to see so many people enjoying the trail and taking pride knowing that this trail is mostly self- funded. Whenever the DNR has been able to provide some support we very much appreciate it, but we never expect it. Anybody is welcome to volunteer or use the trail and I encourage people to visit MTTA’s web site at http://www.skimtta.org . I volunteer on the Mount Tahoma Trails cross country ski system near Ashford, Washington. Our trails and huts are located on the Elbe Hills and Tahoma Forest. I’m up there about 25 days a year and my best job is Assistant Hut Manager at our Copper Creek Hut. I enjoy cross country skiing, but even better is being able to help operate and maintain the trails and the huts. We have at least 4000 daily users during the season and our huts can hold 30 people each night. Our ski patrol has about 60 active members who also groom the trails using 3 big snowcats and a fleet of about 10 snowmobiles. In the off season, we maintain the trails and the 3 huts. As a single Father of three young Children I know I would not be able to afford to teach my kids to Down Hill Ski due to the high costs of lift tickets. But I could gather or buy used Cross Country Equipment and teach them to XC ski. After a few trips up to the Mount Tahoma Trails Asso. system out of Ashford my family fell in love with this amazing system. My family has wonderful memories of time spent on the trails and in the Hut’s. In order to help support MTTA, since cash was not an option we started volunteering our time helping. We have been helping, this organization, doing volunteer work for over fifteen years now. We hope to be able to continue helping and skiing at MTTA for years to come. Please keep these public lands open so that this amazing system with great Hut’s are available to the public so I can create the same memories with my Grandchildren. I am a member of Washington ATV Association and I take part in the DNR user meetings held every other month, of which many other user groups participate. We do most of our volunteer work in the Capital Forest area in the off season, but we have went up to Tuhaya to help in that area. We put in over 2ooo hours of volunteer hours last year, including the Great Gravel Haul In that was held in March. We will be there for this event this year also. Many user groups come together for this day and we get alot accomplished. After 30 years, at age 52, I rediscover my #1 recreational passion, dual sport motorcycle riding. While riding my most favorite area, Green Mountain, in the middle of winter, 2010, I encounted a couple elderly fellows on Quads with saws and shovels returning to Wild Cat Trial head. After talking with them awhile I found out that they happily volunteered time and energy to clear out many trees that had fallen across the trail. And once again, a month or so ago, I noticed a dozen or more trees that have been cleared from the trail after one of our large wind storms. I am very gratful to these volunteers on quads that can much more easily carry the tools to efficiently remove these trees so that I and all others can enjoy this wonderful Green Mountain area. For a small part, I have made it my comittment to always carry a trash bag in my vehicle to collect trash from each parking area that I ride out of. My hope is that we can work together to make this wonderful resource enjoyable to each person who enters the Green Mountain Recreational Area, what ever the preferred method of recreation may be. To all; happy walking, biking, horse riding and motorcycling. I volunteer at Walker Valley the most. I have also invested some time into Reiter forest. I enjoy the DNR parks that we are allowed to ride at and I enjoy giving back. I do most of my work at Walker valley now as it is the closest area to my home and it has my favorite terrain. I have volunteered at club sponsored parties and at the DNR volunteer party every second Saturday of each month. I have also come out and volunteered on my own, but cutting back brush on the 1-5 trail and clearing limbs out of trails on my travels. I try to give up one riding day every month because I want to have trails available for me to ride for many many years. I have even thought of making a career change so that I can learn more and help my fellow enthusiasts in even more ways. One of the best things that ever happened to cross-country skiing in this region was the 1990 agreement between the DNR and the Mount Tahoma Trails Association, creating a hut-to-hut ski and snowshoe trail in the Elbe Hills and Tahoma State Forest. All the trail maintenance and trail grooming is done by volunteers, as well as the hut maintenance. Volunteers contribute upwards of 9,000 volunteer hours every year, and provide a safe and rewarding winter backcountry experience to an estimated 8,000 visitors annually. On any given weekend, you will find a dozen or more MTTA volunteers, generously donating their time and skills for the public benefit which this trail provides. I am a member of the Pierce County Chapter of the Back Country Horsemen of Washington. The mission of BCHW is “very generally” to maintain trails.We practice this idea in many different forests (USFS,Private, County, State lands etc.). The one location that our chapter does the most volunteer work at is Elbe Hills. literally thousands of volunteer hours are accumulated by our members each and every year at this site.While many of us participate in the ongoing work parties, there is a core group of Tom Faubion, John Jensen, Bill Rodwell and Mike Lentz that provide the majority of the work. For the most part they are at Elbe every Wednesday and every Saturday throughout the year, more often when required. They do everything from clearing brush, treadwork, water bars and dips, constructing turnpikes and bridges and and clearing downed trees from the trail. providing trail markers and picking up the trash. Our chapter as a whole is quite active in both our use and our maintenance of this unique treasur of a property . 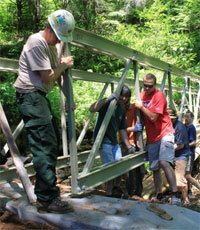 In the summer of 2010 the Friends Of Capitol Forest (FOCF) were asked to assemble and install a 40-foot fiberglass bridge over one of the creek crossings on the Molley Porter #8 trail in the Capitol Forest. Flooding 2 years earlier destroyed the old bridge. A few of us spent 2 weekends and a several evenings digging in the footings and packing some of the bridge pieces into the site which was about 1/2 mile from the road. On the third weekend we had about 25 volunteers show up both Saturday and Sunday. Most were FOCF regulars a few were from some of the other user groups, we even had a couple people who had shown up to go for a ride and ended up spending their day as pack mules and wrench turners. I have no idea how many nuts and bolts there are in that bridge, but I do know how much work a group of hard working people can accomplish in 2 days. I thought we would be working on that project for months. When we packed our tools and left Sunday evening there was a complete fiberglass bridge where once there was only debris from the previous wooden structure. Many hands make light work. I am always impressed by the amount of work that is accomplished when a group of hard working motivated people all pull in the same direction. I have never “volunteered”, but when I go 4 wheeling I usually leave with a full garbage bag. I will stop for any piece of garbage no matter what size. I’ve noticed other wheelers doing the same. That little bit adds up quick and I would like to recognize the entire 4×4 community for the effort. For many years the family and I have participated in DNR trail work and cleanups. We try to make a couple of events a year to support our ORV passion and get other involved. My Jeep Club (PNWJeep) is full of active members and forum users alike that do there very best to support motorized recreation on public lands by volunteering their time and Tahuya ORV and Elbe Hills ORV. It is very important that we mantain these areas for the generations to come, so they can experience the outdoors and the motorized sports which brought us there today. For years my wife, 5 kids and I have enjoyed family outings, site seeing, ATV riding, 4 Wheeling, camping and long ago horseback riding at the Ahtanum State Forest. Later on we found Beverly Dunes was also a lot of fun. These two places mean a lot to our family outings so we want to give back to those areas. We work in groups for safety. With the All Wheelers Off Road Club and now with the Yakima/Kittitas Forest Watch Association we have logged many hours at the Ahtanum State Forest doing all kinds of volunteer work. We remove a lot of forest debris from most of the roads and trails every year so people do not make by-passes. We help maintain the Green Dots and other signs. We have hand dug water bars, dug ditches, rocked stream crossings and blocked off areas that could get easy resource damage. We reopened the Blue Lake trail after it was logged. We helped to get Tree Phones Campground open by get rid of the trees and debris from when the DNR dropped the dead Lodge Pole Pines that the beetles killed. We hold annual clean-ups at the Ahtanum State Forest and Beverly Dunes. We do some type of volunteer work every month for the DNR Managed lands in hope to help keep them open for generations. I nominate Jeff LaBreck of Capitol Riders Chapter of the Back Country Horsemen of Washington. Jeff works on non-motorized trails in Capitol Forest. He can be counted on to come out and remove large trees that have fallen across the trails, clear garbage and generally volunteer on whatever needs to be done. He has spear headed trail renewal projects where winter water damage has created non-sustainable trails. He is out spoken and gung ho. Our volunteers are extraordinary! We are fortunate to work with thousands of creative and generous people statewide. There are countless examples of collaborative and creative problem solving within our volunteer program. Please take a moment to share your story. ~ Christine Redmond, DNR Volunteer Program Coordinator.